beehomesoon: REALLY?!!! I want a Queen like Elizabeth, who will never leave. . . . REALLY?!!! I want a Queen like Elizabeth, who will never leave. . . .
July 8th I made a split. It has now had exactly three weeks to do something. The first picture is the resulting new colony. My objective with this one is just to grow bees--not honey for now. Having two hives seems like a good way to handle some bee emergencies. They are enjoying the new pumpkin patch. There are a great number of bees in here, I think, due to the good brood that went in. The split was made by taking four frames covered with brood and nurse bees and just putting them into this 8-frame hive body. There was open larva and eggs and also at least one or two capped queen cells. (These bees of mine LOVE to make new queens--more on that in a minute.) Initially, there was a drift back to the big hive which is 150 feet away. Perhaps a nuc would have been a more traditional option, but I do not own a decent nuc. I filled out the rest of the 8 frames with new Pierco frames. I have been feeding them from the beginning, but today the feeder has come off. I believe that with the golden rod coming on, they should be fine. And look at all the pumpkins they need to pollinate. I still see few bees around the yard. I have had flowers all summer and a vegetable garden crying out for bees, but they go -- where DO they go? Straight up and into the trees to the south mostly. What have I observed so far? About a week into the split, there were more than 20 queen cells. Crazy! 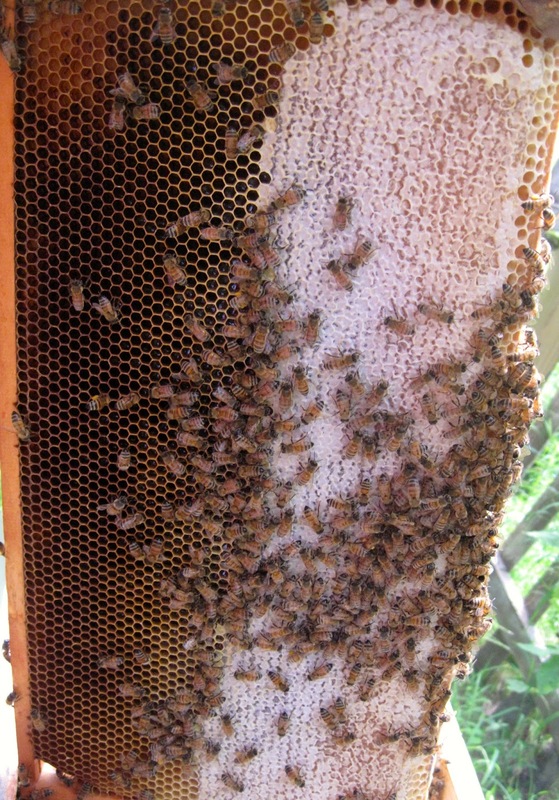 Today's check showed that the queen cells have all been opened. One day last week I saw a lot of flying out and think that was a virgin queen taking a flight. But I've been sick and very busy and didn't watch closely enough to see another flight. Today I took out every frame. No eggs. No larva. And all the brood has hatched, I think. And I could not identify a queen. Again. . .? Really?! All those queen cells and no queen? I am hoping she was just small and I couldn't see her. Three days from now I will check again and if I can't see some signs of an active queen, I will buy a new one. I am thinking of going with Russian Queens supplied by Dan Conlan of www.warmcolorsapiary. He swears by them. Ready to open up. Sugar syrup spray with Honey B Healthy and my smoker going. Most of the bees are still on the top four frames that I moved into the box. But there is activity on the other four, too. The bottom edge of this frame has a lot of drone cells. There were drones milling about. Same frame. The noise and aggressiveness of this hive were not usual today. Does that signify a queenless hive? Could they really have killed ALL those queens? Now to check the Deerfield Door hive--the original. It looks from the outside to be very active. I had put on a honey super with all new wax foundations on the day I made the split. I was trying to make sure they had PLENTY of room and no thoughts to swarm. This queen is young and there is lots of room, especially since I took out 4 frames of brood: so there should be no swarming. But these are my bees. I wish I could say you just put the bees in the hive and they really take care of their own growth, but I am finding this frustrating. They are not growing as they should. I can't identify what I am doing wrong--or they are not doing. Good location. Near a pond. No sign of predator problems (skunks and bears). What I wanted to check today: If I could find the queen, I was ready with a paint pen to mark her. I wanted to check my varroa mite levels. I was looking for the health of the brood and larva. I opened some brood cells to check for mites. And I looked for queen cells. T H E N . . .I heard it. Not what I expected. The piping of a virgin queen. What is that, you say? This is the little chirping kind of sound made by a new hatched virgin queen. (And really, I am kind of impressed with myself that I could identify that little noise.) This hive, though bigger, by far, was so much more calm and quiet than the split was. The new queen is looking for her adversaries so they can duke it out. I wasn't looking for a New queen. I tried very hard to locate her. And I had it narrowed to one corner of a frame, but I could not see her. It is possible that she was still in the queen cell located there and was piping from within. No sign of the old mated queen to paint my little dot on. What is up here? No eggs in this hive. No open larva. Plenty of closed brood cells. So if Queenie #3 is gone, it has happened within the last week, I'd guess. Did she swarm? WHY OH WHY? would she do that? I would expect a lot more bees in this hive, so a swarm is probably the answer. Last week was a blur of grandchildren for 4 days and a terrible virus before that. Could have happened. But most unexpected. Lots of honey. Not too much pollen, but the bees are loaded with it today. After opening the hive there were mountains of pollen balls left outside that they just dropped in the chaos of an open house. Last thing: mites. Hoping they are not the cause. So I did an alcohol wash that I learned from Ken Warchol ( the state bee inspector--our local bee whisperer.) Not one mite. That even seems kind of fishy. But that white coffee filter was completely free of mites. I think my disruptive breeding schedule is keeping the mite count low. Suppose that is the good news of the day. What's next: watch for that piping queen to take a flight or two soon. The weather here in New England is perfect this week--sunny and in the 80's every day. Three days and I will start checking for eggs. If I can't see anything going on--Russian Queens to the rescue? So. . it will be some days of bee anxiety again. This is supposed to be a calming activity. . . . . 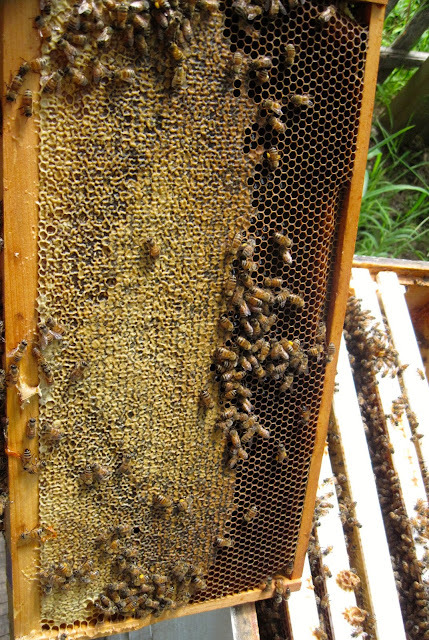 This is the top of the top hive body. They have been building comb to get up to the honey super, which was just above them here. I see lots of wax building on the Pierco frames. Wooden frames with wax foundation are quite a bit shorter than the Pierco. This may be why they need to build up to the next box. But this comb is all empty. Not a bit of building or honey on any of the eight honey frames. 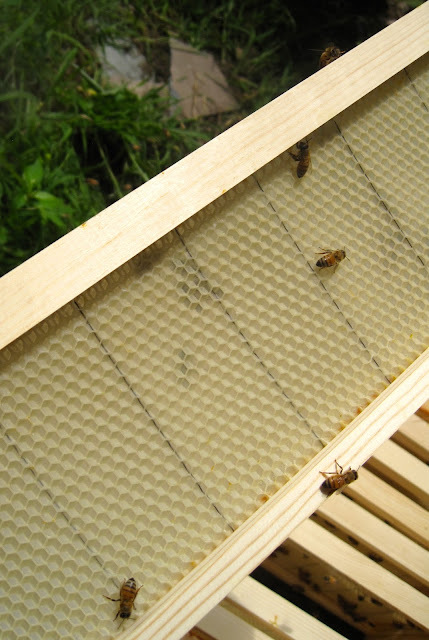 This frame is HEAVY with honey on both sides. The other side. This side looks a little lumpy--not smooth and pretty.